1. first mix chopped onions, tomatoes, ginger, garlic, cashews, mace, cinnamon, cloves and cardamoms with 1 cup water. 2. cook everything til the tomatoes and onions soften without a lid. cook for about 14 to 15 minutes on a medium flame. allow this mixture to cool. 3. then add everything including the stock in a good blender or grinder. grind to a smooth paste. remember there should be no small pieces of cashews. everything should be ground very well till smooth. 4. heat butter in the same pan. 5. add tejpatta (bay leaf) and saute for a few seconds. 6. add the ground makhani paste. stir well. 7. sprinkle red chili powder. ( i have used kashmiri red chili powder which gives a good color. you can also use deghi mirch). 8. stir well and saute the masala on a medium flame. 9. keep on stirring often. you have to saute the masala till you see the butter leaving the sides. it has to sauteed so well. this takes time but patience is the key. takes about 20 to 22 mins on a medium to high flame. check the step by step pics (picture no 9) for the consistency of how the masala paste should be before you proceed to the next step. 10. now add slit green chilies, salt and water. 11. again stir very well. cook for 2 to 3 mins. 12. then add honey or sugar and again stir. 13. add the paneer cubes and simmer for 2 mins. 14. add the cream, kasuri methi and garam masala. 15. stir and switch off the flame. check the taste and add more salt, honey or red chili powder as required. 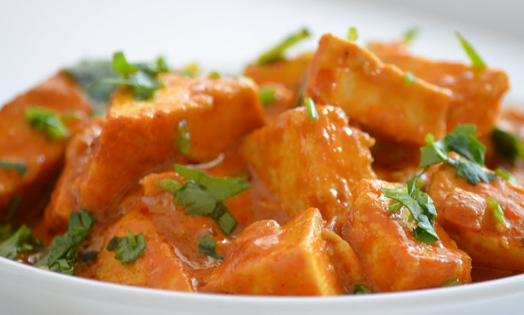 serve paneer makhanwala garnished with cream, grated paneer, ginger julienne, and coriander leaves, hot with naan or rotis.